"A Night at Big Top Chautauqua"
As you walk on the gravel parking lot and look up at the big blue circus tent, it's hard to believe that talents such as Johnny Cash, Willie Nelson and B.B. King have played in this place. Walking into this blue canvas theater, the magic overtakes you. The acoustics in this 900-seat venue are breathtaking as the local talent of the Big Top Chautauqua house band, the Blue Canvas Orchestra, amazes you with their talents. ​On balmy summer nights the tent sidewalls can be lifted and people may sit outside and even up on the hillside. The sound is superb and on clear nights you can see the Milky Way and sometimes even the Northern Lights! ​Celebrating over 30 years of presenting “Culture Under Canvas,” Lake Superior Big Top Chautauqua is a non-profit arts organization with a mission to provide entertaining and educational activities with an emphasis on performances that celebrate history and the environment. 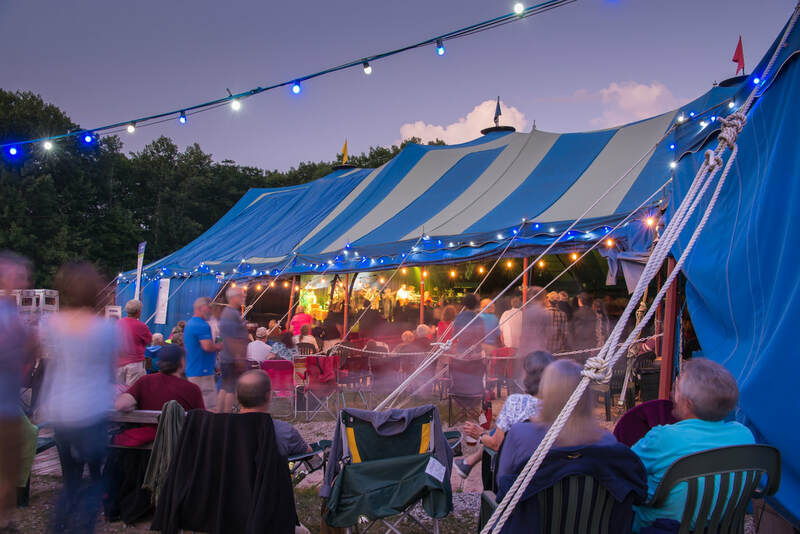 Big Top presents over 60 concerts, shows, and events June through September in an intimate 900 seat all-canvas tent, including international headliners, regional talent, and original productions. Our unique summer venue is located at the base of Mt. Ashwabay just outside of Bayfield, Wisconsin. Perched on the shores of Lake Superior, Bayfield is known as the gateway to the Apostle Islands National Lakeshore and the Gaylord Nelson Wilderness Area. The Big Top stage has hosted Johnny Cash, Willie Nelson, Garrison Keillor, The Smothers Brothers, Emmylou Harris, John Prine, Nanci Griffith, Buddy Guy, Steve Earle, Brandi Carlile, Keb’ Mo’, Taj Mahal, Jonny Lang, The Mavericks, The Beach Boys, John Hartford, The Nitty Gritty Dirt Band, Del McCoury, Bill Monroe, Bonnie Raitt and many more renowned artists. Our own unique brand of shows feature songs and stories performed by Big Top’s Blue Canvas Orchestra and Singers. Together with a multitude of talented guest artists, our original productions bear the hallmark of exquisite musicianship illustrated by big-screen visuals. In addition to performances at Big Top, the Blue Canvas Orchestra tours throughout the region. Big Top also produces the nationally-broadcast radio show “Tent Show Radio” heard on Wisconsin Public Radio and other listener-supported stations. This weekly one hour program relives the highlights of shows from the previous season at the Big Top stage. It is online and aired on public radio stations throughout the country with its host, Michael Perry. During intermission of each show, Mike spins a story “from the backstage dressing room, with the one lonely little light bulb burning.” Topics range from Mike’s battles with trees, to the behavior of rogue chickens, to the search for hope while stoking a wood stove in the darkness.​ "Tent Show Radio" is also available for streaming at www.tentshowradio.org. Lake Superior Big Top Chautauqua provides entertaining and educational cultural activities with an emphasis on performances that celebrate history and the environment.